Before proceeding further let us understand the ground rules. Goggle Trends is an automated tool and some of its limitations are explained in a footnote to this post. But at the best Google Trends provides food for thought and at worst offers a much needed alternative to the shockingly bad Christmas TV and radio schedules here in the UK. To play the what is hot classical music game simply go to the Google Trends homepage and type in your search term. And hey presto! If the trend is uphill it is hot, if it is downhill that says it all. So what conclusions can be drawn from this exercise? It is tempting to dismiss Google Trends as only of marginal relevance to classical music, because, after all, there is no link between volume of internet searches and artistic merit. In which case what is hot and what is not becomes a harmless Christmas game. And I must confess that is how this post started. But the more I looked at the search data the more I wondered whether there was more to it than classical music's online equivalent of trivial pursuit. At which point the argument can take one of two paths. The mass marketers will argue that classical music simply has to up its game in promotional terms and become cleverer at leveraging new technologies and social media. But there is an alternative argument, and it is a fascinating one. Let's stand back for a moment. Gustavo Dudamel is a very talented and appealing conductor: Cage Against the Machine created a lot of buzz: there has been wall to wall Mahler on radio and in the concert hall for the past twelve months: and the BBC has done everything possible to popularise Radio 3 and the Proms. All of which adds up to an awful lot of mass marketing. Yet none of this created a hot property as defined by Google Trends. Could it be that classical music does not respond to mass marketing techniques? Could it be that because classical music predates the mass media it speaks a language that does not translate into the argot of today's social media? Could it be that, to borrow a term from economics, classical music is mass marketing inelastic? - meaning it only shows a very limited response to mass marketing techniques? 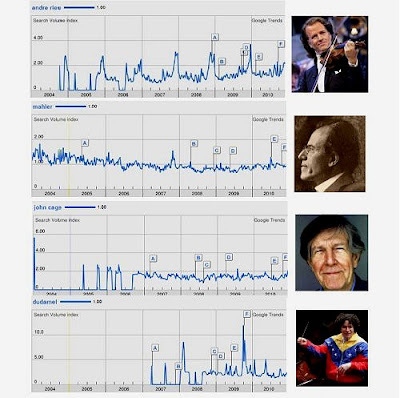 Could Google Trends be confirming classical music's mass market fallacy? Does classical music need more tweets? Or does it need alternatives to mass marketing? Happy Google Trending! We hope you find this service interesting and entertaining, but you probably wouldn’t want to write your Ph.D. dissertation based on the information provided by Trends. And the same can be said for this post. invents a machine to measure spring with? John Cage does spike considerably in the end of the year in the UK: http://www.google.com/trends?q=john+cage&date=all&geo=gbr&ctab=0&sa=N and http://www.google.com/trends?q=john+cage&date=ytd&geo=gbr&ctab=0&sort=0&sa=N. Not that that matters very much, of course. RM, you are quite correct. To try to acknowledge that I said "John Cage is showing only a limited response to the Cage Against the Machine exposure" and did include the twelve month trend. But, having said that, I was surprised the spike was not bigger. One explanation may be that long established figures such as Cage and Mahler have a base volume of searches which are not event related. Because of this base level an event blip deflects the trend by a small amount compared with newer figures who do not have the same ongoing base level of searches. As I said in my post it is tempting to dismiss Google Trends, as indeed the first commenter does. But it is interesting that you, by contrast, took the post seriously enough to drill down in the John Cage data to country level. As I also said, Google Trends does provide food for thought. It seems possible to me that classical music doesn't respond well to mass marketing, or at least the mass marketing that's been tried. I wouldn't necessarily write it off as un-mass-marketable though. It's also possible that the techniques that've been tried just haven't been targeted well enough or haven't used the right message to get across to those not in the club already. It's even possible that the people who find their interest sparked are let down when they go to an event and it's not as hip as they were expecting. Pretty much everyone I know is completely ignorant of classical music and I have never heard any of them mention Dudamel or Le Grande Macabre. To me, all the talk about Dudamel was conducted in a way that only made it relevant to those who were already interested. Likewise, I've read insightful comments about the Ligeti opera to the same effect. I'm inclined to believe that mass marketing, and delivering on that hype, is a lot trickier than the classical world expected more so than impossible to apply to classical music. Now, I'm not pretending to be an expert on marketing, so please take this with a grain of salt. For instance: Spiderman the musical. I'm not a fan of musicals, so what I know of it has been extracted solely from the mass marketing machine. Here's what I know of it: the music is by Bono and The Edge; it's produced and directed by someone well-known; it has plenty of special effects; and it cost 40+ million to make. Now, all this does not speak of its quality as a product, but does give me an idea of what was involved in its creation, i.e., money. It does have value, regardless of the product. Now, to get back to my original point, how does one value, say, Mahler's 5th? In terms of how many players? In terms of who is conducting? If so, then to what, whom or where are we assigning value? Ultimately, I would guess that it's in the final product, the piece and the sound. How does one, then, market an ephemeral quality and experience of sound? It's a very elite judgement that the consumer must make in order to evaluate it. In a sense, Pliable, you're on to something. This perhaps contributes to its inelasticity. Or perhaps we're mistaken in assuming that classical music is marketable. Either way, without knowledge of the product, how can any marketing campaign succeed? Naive rambling aside: great post.